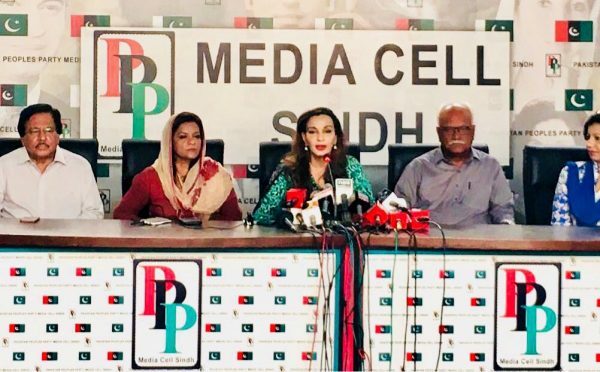 KARACHI, May 13, 2018: Senate Opposition Leader, Senator Sherry Rehman, slammed former Prime Minister Nawaz Sharif for what she calls, “Irresponsible, self-serving and damaging statement”. “Nawaz Sharif should really explain his position as a third time elected Prime Minister. He cannot make such an irresponsible statement inimical to the national security of Pakistan and to its stated foreign policy, even during his own time,” said the Senator. “Pakistan is fighting a huge inland war against terrorism against all odds alone and constantly under international criticism and he is adding fuel to that highly critical narrative. Instead of pointing a finger at his own country, we want to ask what he has done as the head of a ruling party for accelerating the fight against non-state actors. Terrrorism and violent extremism threaten the stability and prosperity of Pakistan. It is Mohtarma Benazir Bhutto who gave her life to this fight against terrorism and the PPP government that started operations against terrorism in 2009. What did the ruling party do to the National Action Plan? He totally ignored it but just wants to raise his international profile by asking provocative questions that put Pakistan in the dock,” the Senator reiterated. “If he wants cooperation from state actors, he should certainly not be framing the narrative against Pakistan’s national interest. He is a three times elected PM, whose voice gets heard. There is no concrete evidence linking Pakistan to the Mumbai attacks or for Mumbai to proceed with a trial. Pakistan, too, wants a judicious resolution of the the Mumbai case and we are still waiting for the requisite evidence from India,” asserted Rehman. “The PPP has always stood for bringing the peace dividend to the region. India’s current conditional position liking terrorism to dialogue is non-conducive to sustained conversation , but this too needs to change. South Asia needs trade, cooperation against terrorism and climate change among other things. Unfortunately the constant hostilities and escalation of violence in the LoC and Kashmir are making it more difficult,” concluded Rehman.